Welcome to an inside look into some of the most important personal finance luminaries online. These influential people educate and entertain others about money topics. From authors to podcasters to writers, these money mentors are working to raise the level of financial knowledge and education. 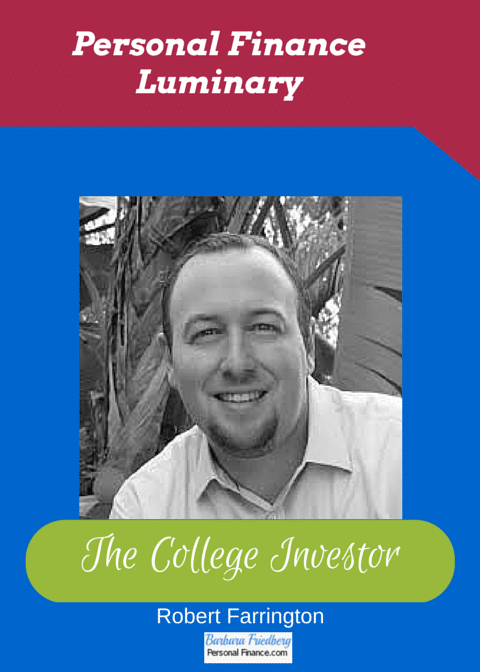 Robert Farrington, the College Investor, is an expert in millennial personal finance and student loan debt. 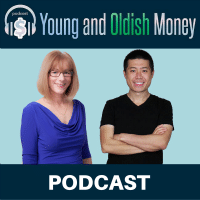 Enjoy this interview with Robert, personal finance luminary college investor, one of my favorite online inspirations. 1. What is your background and money/financial influences? I honestly started blogging about personal finance because I was bored and I’ve always had a passion for money. In college, I went to my schools investing club, and I was pretty disheartened by what I found. It was really just a bunch of amateurs talking about day trading and penny stocks. It wasn’t what I was interested in. Then, as I talked to more of my friends, they were searching for the information I wanted to provide. Finally, one day sitting in the back row of my econ class, I decided hey, I’m just going to start writing on a blog about this stuff. That started The College Investor. After writing for a few years, I kept being frustrated at roadblocks stopping young adults from investing. As such, student loan debt started becoming a central theme on the site as well. It’s since evolved into one of the largest sites dedicated to helping millennials navigate out of student loan debt and start investing in their future. Given what the site has become, I’ve also been able to brand myself as America’s Student Loan Debt Expert, and I regularly help students and graduates navigate the crazy world that is education financing – all with the end goal of helping them be able to start investing and building wealth. 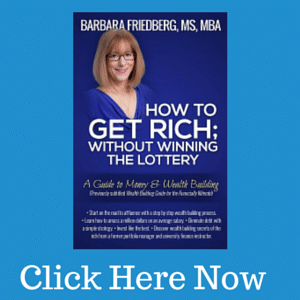 Learn wealth building basics in a few hours here. 2. How do you make time for a full online career and a family? Family is always my #1 priority. Otherwise, it’s time management and solid planning. I am very diligent when it comes to my schedule. I own it and maintain it. For work, I try my hardest to maintain strict times of starting and ending my day. But it’s not uncommon for me to get up at 4:45 am and make sure some online stuff happened before work. For my online business, I plan diligently as well. I try to focus 3-6 months out – I maintain a full content calendar that far out, and break up the months in themes. I do the same for all my external writing as well, such as Forbes and other publications. I rely heavily on Asana. Finally, I have a great team that supports me. My wife is very supportive. I have a great virtual assistant that handles a lot of my online day to day. And I have great teams at work as well. 3. How did you become a money/investing/entrepreneurship online blogger? I just fell into it. Honestly, I started this in class, and it kept growing. I actually wrote an article about it – how a bad boss, boredom, and a school crush all led me to this. 4. What are your best lifestyle hacks to manage being a dad, employee with a management job, entrepreneur, and spouse? #1 Time Management – Control your calendar, and organize your life. At work, I own my Outlook calendar, color code it, and make sure that my work day stays my work day. I leverage a calendar for my online business as well, but not as much. #2 Organization – You have to stay organized. Online, I use Asana to keep track of all my projects. I use it as a combo To-Do list and project manager. My blog typically is my project, and I assign dates to tasks and use it like a list to execute. I even organize my financial life very specifically. #3 Read Fast and Type Fast – I tell all new managers and bloggers this. The faster you read and type, the easier life will be. Take some lessons to learn to speed read and you’ll dramatically see improvements in productivity. #4 Outsource – Outsource everything that doesn’t require you to actually do it. Anything that isn’t you. For me, I write and share my thoughts, so that’s what I do in my business. I outsource some task writing, images, clients stuff, tech stuff, graphic design, and more. #5 Family First – Work and business seem important, but why are you doing it? Take care of your family first. It may mean you miss an appointment or don’t get that post scheduled, but the outside world really doesn’t care – but your family does. And they’ll notice you missing out very quickly. My family first and foremost. A subset of that is building wealth. I honestly want to give myself and my family a certain lifestyle, and while money alone isn’t important, it does drive comforts and ease that we enjoy. Another big factor is helping others. The student loan system is, frankly, frustrating and wrong. A lot of people get off track and don’t know what to do. I love helping people get out of debt and start building wealth. I recently had someone I’ve been coaching for about 3 years get their debt under control and saved enough to close escrow on their first house last week. That’s a great feeling, knowing you helped someone else achieve a financing dream. 6. What are your best tips for living well and economically? One of my biggest philosophies is that everyone should live the life they want, but they have to understand what that really means. I’m a big believer in not being super-frugal. In fact, no matter how frugal you are, being frugal will NEVER make you wealthy. You have to find balance, and I created a Frugaliy Equation that discusses it. Basically, there are a lot of tips on frugality that really don’t make a lot of sense. But sometimes it does make sense to be frugal. The best way to live well and economically is to be mindful of your spending, but to build real wealth to earning extra income and developing passive income streams. The average millionaire has seven different streams of income. Do you think that they are focused on the cost of diapers? No, they are hustling and earning more money. That’s what most people need to focus on to get ahead. 7. What are your biggest splurges? I eat out a lot. I love food, and I love dining with my family. We eat out at restaurants and casual dining places 5 nights a week. We could probably cut our food bill 50% by cooking at home, but we enjoy going out. 8. What are your most important projects now? I just wrapped up a really fun project putting together all the different student loan forgiveness programs offered by each state. For example, if you live in California, there are three special California student loan forgiveness programs that are different than the typical Federal student loan forgiveness programs. There are even nine different Texas student loan forgiveness programs. It’s crazy how many options there are out there if you look, and it was a blast putting together that resource. Our ongoing project right now is continuing to build out our four main verticals: Escape Student Loan Debt, Save More Money, Earn More Money, and Learn To Invest. We redesigned the site earlier this year to focus on these key areas, and we are focusing on content for them. Finally, we also launched our DIY Ditch Your Student Loans Course. This is designed for people looking for guided help on escaping their loans. We walk you through exactly what to do, who to call, what to say, and give you the specific forms you need to fill out. It’s a one stop shop for potentially lowering your student loan payments, or even finding forgiveness programs. 9. What are your biggest financial suggestions for the readers? #1. Get organized. Too many people struggle with their money simply because they aren’t organized. 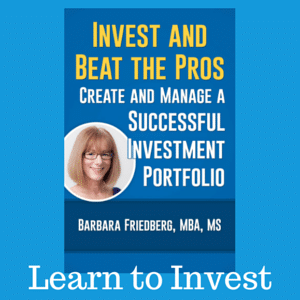 There are lot of free tools to help – I love Mint and Personal Capital. Just spend 30 minutes, input all your information, and you’ll quickly see where your money is going. #2. Start Investing. The biggest enemy of investing is time. It’s also your biggest ally. The earlier you start investing, the longer your money will compound and grow. The later you start, the more money you’ll need. Millennials have the distinct advantage of being young, so there is really no better time to start than now. 10. What advice would you give to someone who wants to be an entrepreneur? Solve a problem. I didn’t know what problem I was solving for a long time, and as a result, it took years for me to attract readers, followers, and now paying clients. Target a specific problem, come up with a solution, and test it. I love silly tests, like walking up to strangers and asking if they’ll buy your product or service. You’ll get genuine reactions and you’ll know very quickly if you’re onto something. 11. What are your biggest professional mistakes? The biggest mistake I made in starting my online business was failing to network. I sat in my little corner of the Internet for several years before making connections and reaching out. That made a huge difference. I learned so much, and I grew. I was able to build a support network, and I was also able to help others. The power of the network is huge. Part 2 of that is meeting your network in person. Going to my first conference was a game-changer online. And by game-changer, beyond meeting people face to face, I made business connections that doubled my income the year after the conference. That’s huge. Failing to network put me 2 years and hundreds of thousands of dollars behind where I could have been. 12. What is your best professional accomplishment? My best accomplishment is simply helping others online with their struggles getting out of student loan debt and then navigating the complex world of investing. It’s great to be recognized as an expert in millennial money, student loan debt, and other financial areas. 13. What’s your best advice for your millenial peers? Start investing now. You can’t go back in time and repeat these years. Even if you only have $500 to start, start investing. A version of this interview was previously published.